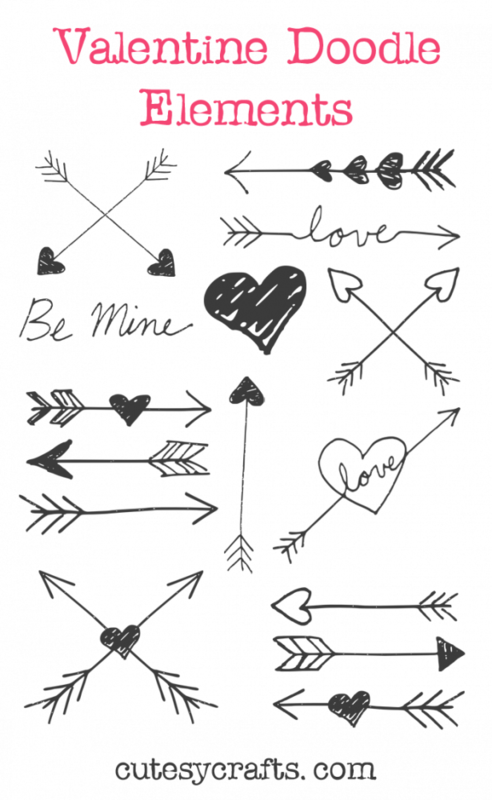 When I made this Valentine’s Day Arrow Art, I knew I wanted the look of some hand-drawn arrow elements. I’m not great at getting it right the first time, so I decided to experiment by doodling on some paper first. After a little bit of research, I figured out how to make my hand-drawn doodles into computer graphics, so now I’m offering them to you as free Valentine’s Day graphics! Download the free Valentine’s Day graphics here. They are in a zipped folder for you to download more easily. I’ve provided two types of files for you. The PNG files can be used in photo editing programs like Photoshop or Picmonkey, and the SVG files can be used in Illustrator or Inkscape. From those programs, you can change the colors and sizes to fit your needs. To see how to use them in Picmonkey for free, check out my friend Tori’s great video tutorial here. Let me know if you use them. I’d love to see what you make! So glad you like them! I was hesitant to share because I didn’t know if anyone could use them.